Many projects collect user feedback via a central bug tracker. 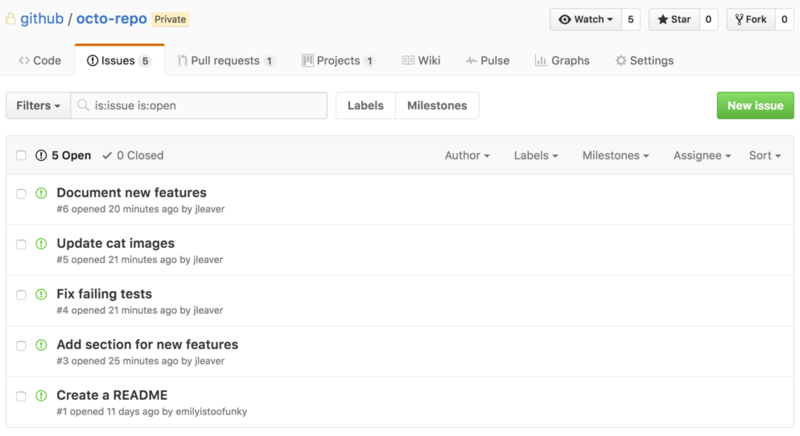 GitHub Enterprise's tracker is called "Issues," and can be used with every repository. Issues can act as more than just a place to report software bugs. As a project maintainer, you can use Issues to organize tasks you'd like to accomplish, such as adding new features or auditing old ones. You can associate issues with pull requests, so that when you merge a pull request, your issue will automatically close. If you're using a project board to track and prioritize your work, you can see what project board an issue is a part of by viewing the project board section within the issue. You can help contributors open meaningful issues for your project by creating issue templates that prompt them for information. For more information, see "About issue and pull request templates." You can opt to receive notifications whenever an issue is updated with a new comment so that you're always in the loop. Issues can also be assigned to other users, tagged with labels for quicker searching, and grouped together with milestones. You can also track duplicate issues using a saved reply. For more information, see "About saved replies."